Sunday's vote for a new president in the Democratic Republic of Congo has been hit by a series of delays that have left people frustrated. The failure of new electronic voting machines in some polling stations was one of the challenges. Polls have now closed in an election that is expected to bring the country's first peaceful transfer of power since independence in 1960. President Joseph Kabila is stepping down after 17 years in power. The final result is expected be announced in a week's time. The run-up to the poll had been hit by violence and controversy over the decision to exclude some 1.26 million out of an electorate of nearly 40 million from voting. Polls officially closed at 17:00 (16:00 GMT), but people still in the queue at that time were allowed to vote. Things started slowly in the capital, Kinshasa, because of heavy rain. There have been delays in a number of areas because of problems with the electronic voting machines, which are being used for the first time. There was frustration in Limete, a district of Kinshasa, as the electoral register had not been delivered and people were unable to vote. Those waiting then booed the head of the electoral commission (Ceni), Corneille Nangaa, who had come to the scene. One voter there, Fidele Imani, told the BBC he felt positive after voting. "We have been waiting for two years and I'm happy to vote today," he said. "We want change here, we need peace and security and people need more employment opportunities." There were isolated incidents of violence. A police officer and a civilian were killed in Walungu, South Kivu province, in an altercation at a polling station, a UN official told the BBC. I visited two polling stations throughout the day. At the first location, one electronic voting machine broke down, causing delays, but generally the mood was calm. I arrived at the second location six hours after polling stations were meant to have opened - but no one could vote because electoral rolls hadn't arrived. At least 200 people were waiting, angry at the situation. Finally the electoral roll arrived and voting started. Similar issues were reported by observers in several other locations. Despite a chaotic electoral process, in general voters seemed motivated and glad this historic day finally took place. Regional observers monitored the vote but international observers, who had concluded previous elections in the country had lacked credibility, have not been invited. This week, voting in three districts was postponed until March, with the electoral commission blaming insecurity and an Ebola virus outbreak. The decision in effect cancelled over one million votes, as the new president is due to be sworn in by mid-January regardless. 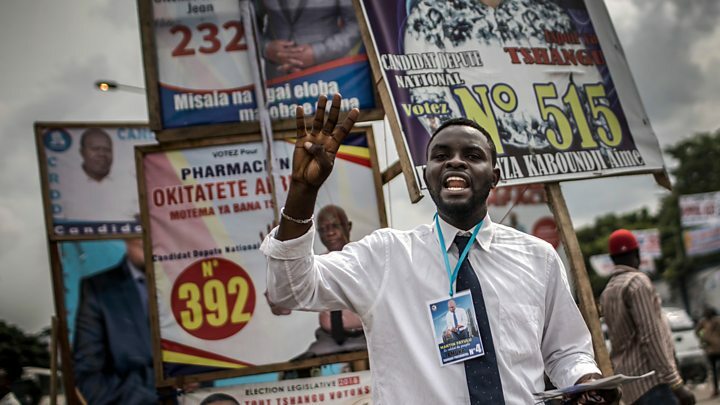 But some activists in places where polling has been cancelled have organised their own election, dubbed "citizen votes", the BBC's Gaius Kowene reports from the main eastern city of Goma. They are using ballot boxes from the 2011 elections and printed their own voting papers. "We want to show the Ceni that if they fail to organise elections here because of Ebola, we can do it," organiser Katembo Malikidogo told the BBC. What's the context for these elections? The current president took over from his assassinated father Laurent in 2001, but he was barred from running for another term under the constitution. Then last week, the election was delayed again. Speaking at a polling station, the president tried to address concerns about the voting, saying: "It's clear that the elections are free and fair."